Kambosos-Perez builds up heat of the Pacquiao-Broner fight. MGM GRAND GARDEN ARENA -- MGM Grand Garden Arena – Below are the early results of the Pacquiao-Broner undercard now underway here Saturday night (Sunday in Manila). Pacquiao's sparring partner George Kambosos of Australia won by unanimous decision over Filipino Rey Perez in their eight-round welterweight bout. Scores: 80-72, 80-72, 80-72 all in favor for Kambosos. Kambosos, who helped Pacquiao get into shape the last two months and himself honed his skills, was busier and caught Perez with good lefts to the body and rights to the head as well as scoring with flurries now and then. Perez, known here as upset-conscious fighter who defeated known fighters Roberto Marroquin and rising prospect Christian Gonzalez in his recent fights, tried to time Kamboson with his left counters who occasionally got in but too far and between. 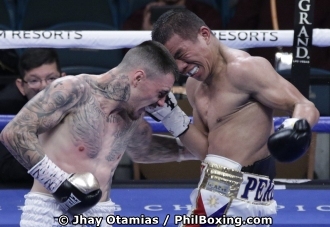 Kambosos has now improved his undefeated record to 16 wins with 9 knockouts while Perez dropped to 24-11-0 with 8KOs. Desmond Jarmon throws a left at Canton Miller. 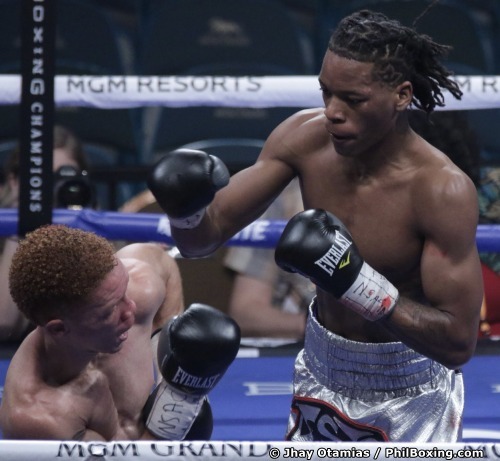 3rd bout, 6 rounds Super Featherweight: Stylish Desmond Jarmon (8-0-0, 4KOs) of Cincinnati, Ohio won by majority decision over Canton Miller (3-2-1, 1KO) of St Louis, Missouri. Two judges had Jarmon winning 59-55 and 58-56 while a third judge had it a draw, 57-57. Dwaye Butler connects with a right at David Payne. 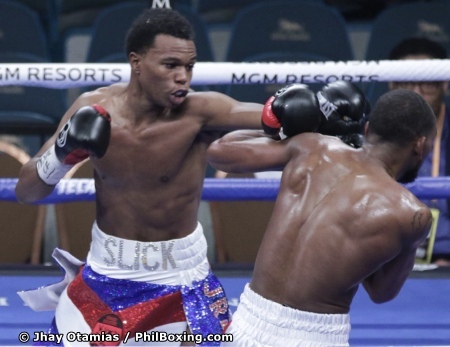 2nd bout, 4 rounds Welterweight: Dwayne Butler (5-0-0, 3KOs) of Chicago, IL remained undefeated winning by unanimous decision over David Payne (3-2-1, 1KO) of Los Angeles, CA. Viddal Riley drops Mitchell Spangler. 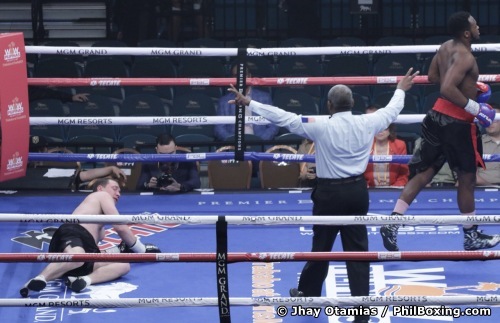 In the curtain raiser scheduled for 4 rounds in the cruiserweight division, Viddal Riley (2-0-0, 2KOs) of Las Vegas via United Kingdom, made short work Mitchell Spangler (0-1-0, 0KO) of Sacramento, CA. Riley sent Spangler to the canvas just seconds after the bell rung in the 1st round and followed it up with a wicked left to the head at the 33 second mark of the round where Spangler stayed to the canvas for good. Riley picked up his second pro win, again by KO while Spangler lost his pro debut.